MyDash is our client-facing app that allows your clients to connect to your business and receive special Deals, book Appointments, check out your Services, re-book from their History and much more! Appointments are booked in real-time so you clients don't have to worry about their perfect spot being filled. 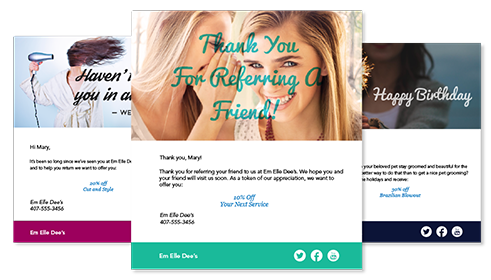 Keep clients coming back with additional loyalty point opportunities and last-minute specials. Personalize MyDash and have your very own custom app in the App Store! 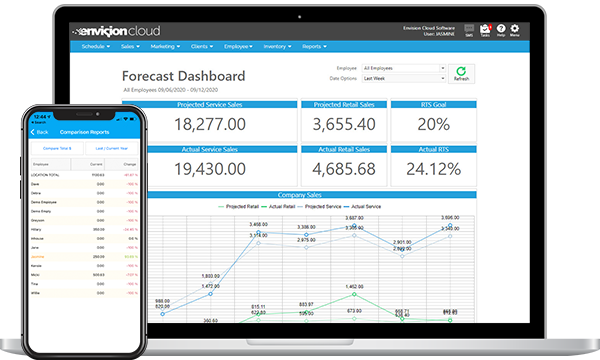 Manage your business in the palm of your hand and empower staff with the tools they need to manage and exceed their goals. 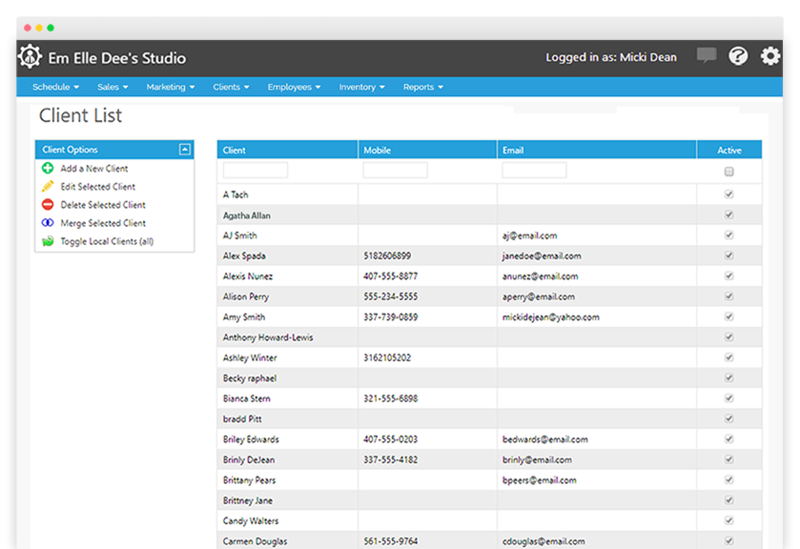 Easily book or modify appointments and block times, access your client list, and check inventory. Always know how your business is performing with a simple tap on your phone or tablet. Staff can compare their current sales and key performance indicators to where they were last year, last month or even the previous day. Fully featured appointment book allows you to book appointments from anywhere, at any time, with any device connected to the internet. No more waiting at the front desk to prebook your client’s next appointment, or calling in every morning to see who is first on your schedule. 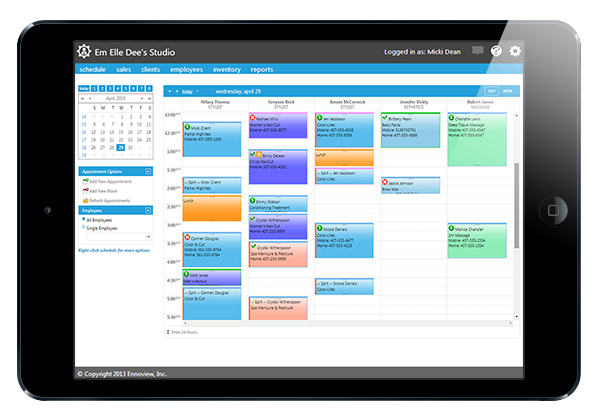 Icon driven and color-coded calendar allows you to see what is going on in your business at a glance. Easily rebook appointments with a quick copy and paste. Avoid booking errors by enabling qualified services, viewing one department, or a single employee at a time. Drastically reduce your no-show rate by allowing Envision to automatically confirm your appointments for you. You no longer have to spend your time calling tomorrow’s clients. You can focus on the clients with you today. SMS confirmations are automatically updated in Envision, so you can see at a glance which appointments are confirmed. Never worry about over-booking your rooms, stations, or equipment for your services. 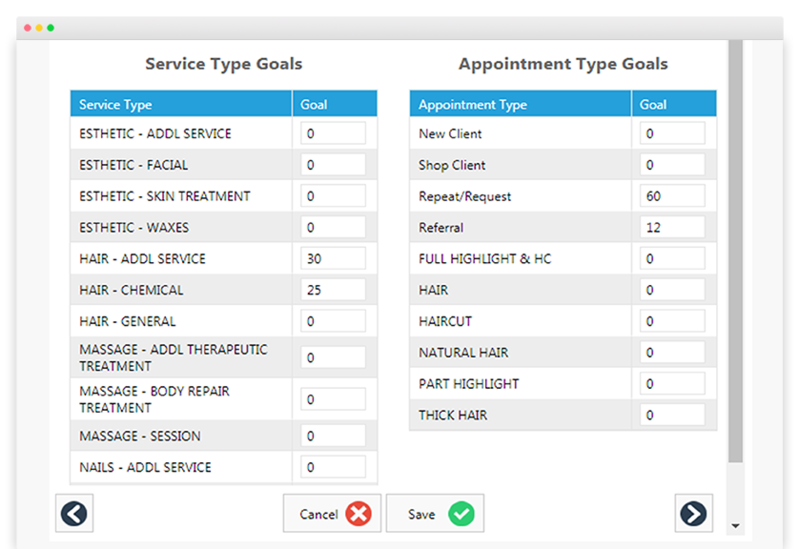 Envision can automatically select the correct resource needed for services when booking an appointment. Avoid having two clients waiting for the same room or station. Add multiple resources to one group. Easily see which resource is reserved by hovering over the appointment. Online Booking Anytime, Anywhere, on any Device! Allow your customers to book appointments online or through your business Facebook page. Appointments are booked in REAL TIME so they appear on your calendar instantly! Provide an easy and convenient way for clients to book an appointment with you from your website or Facebook business page. Offers a seamless booking process so your clients can easily see when their perfect spot is available. Fill your book, even when your business is closed! With Envision, your register is always with you. Easily process tickets using your PC, Mac, smartphone or tablet. Sell packages or prepaid items and let Envision track everything for you. Add multiple tips to tickets. Print or email ticket receipts directly to your clients. Supports barcode scanner, or search for inventory by ID. Never forget to recommend product again! Increase retail purchases by setting Envision to prompt your front-desk staff to suggest retail items when a specific service is added to the ticket. Create recommendations notes with product benefits and usage instructions. Instantly add recommended products to the ticket with one click. Entice clients to purchase retail before leaving by offering specials for products purchased with a service. Accept credit card payments with a seamlessly integrated solution and give your customers a quick check-out experience. 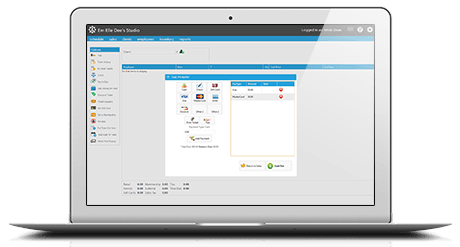 Credit card processing partners offer "Meet-or-Beat" rates for Envision users. EMV compatibility helps to protect your business and your clients from fraudulent charges. Stay PCI compliant and securely store credit card information for recurring billing and appointment reservations. 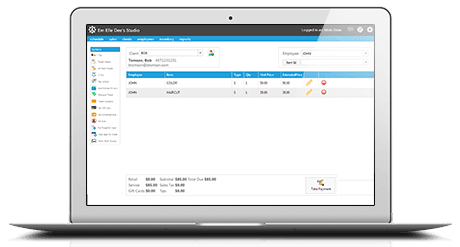 Manage and track your inventory based on your vendor orders and customer purchases. 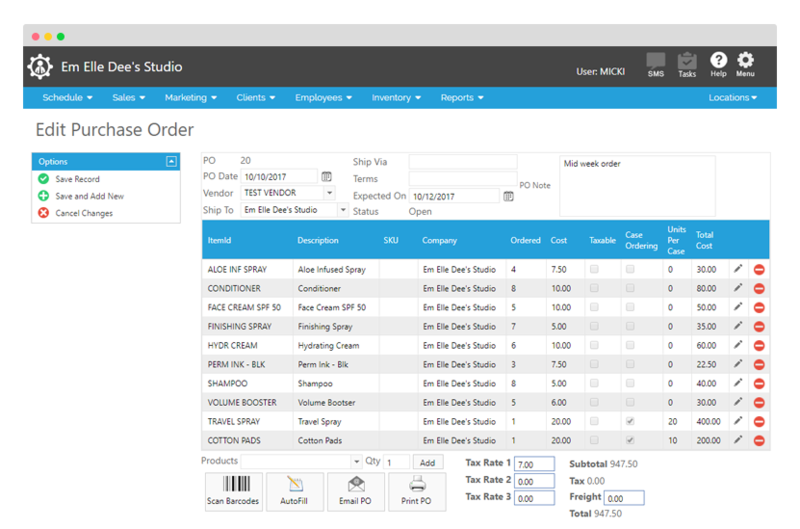 One click automatically fills purchase orders based on expected stock levels or by quantity sold in a date range. Keep your shelves stocked with your most popular products and sell through the items you don't need. Inventory counts have never been easier! Use a tablet, iPad, or any of your favorite mobile devices to update quantities on hand while you're right in front of them. Add to your bottom line and guarantee future income with gift card sales. Easily sell and track gift cards in store and let Envision be your 24/7 gift card concierge with online gift card sales. Increase holiday sales and have guaranteed future income. Give your clients the opportunity to purchase the perfect last-minute gift. Bring in revenue while you sleep! Isn’t it embarrassing when you forget your friend’s birthday or to send that “Thank You” note you meant to send weeks ago? Now you don’t have to worry about remembering those special days for your clients. Let Envision take care of the Well Wishes and Thank You's. We never forget! Retain first-time clients with automated 'Welcome' and 'Thank You for Visiting' messages. Reward referrals with exclusive offers. Haven't seen someone in a while? Retain long-time clients with targeted offers to get them back in the door. Stay in constant communication with your clients and let Envision handle your marketing. 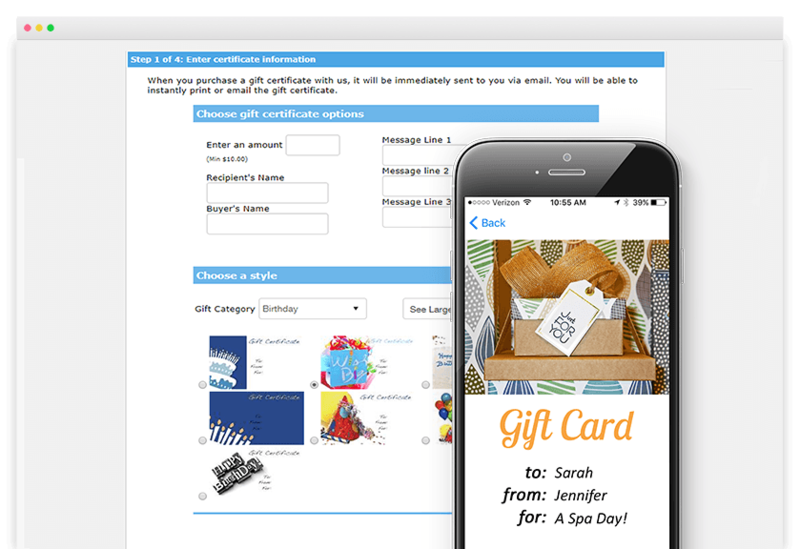 Send promotions, announce new products, or wish your favorite clients a happy birthday! 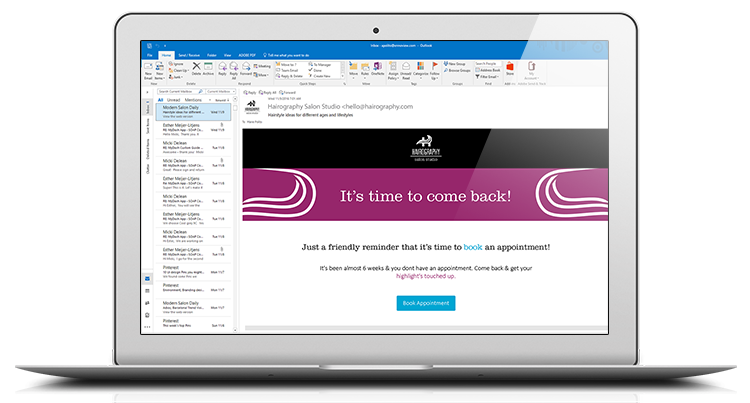 A simple email can be a reminder that it is time to book an appointment, building your client retention. Why pay extra for an outside email marketing service? Emails are sent right from Envision and INCLUDED with your subscription. Create custom filters to target your marketing efforts or reach your whole client list at once. Personalize each message by merging client information into the email. Everyone has those clients who wait way too long to book their next appointment. Now you can let Envision remind them when it's time to schedule their service again. Keep clients on a regular schedule to maintain their service and keep your books full. Send up to 3 service reminders via email, text, or both. You determine the message schedule to fit your services. 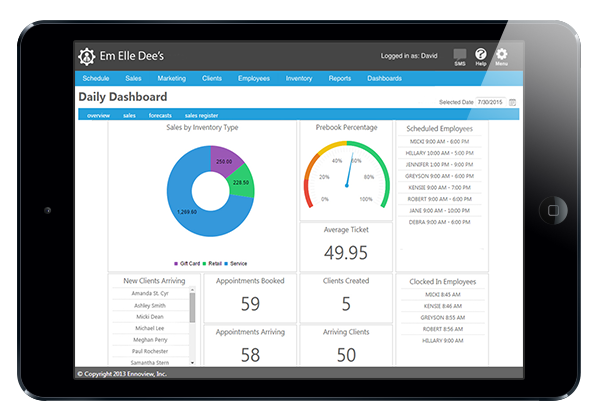 Envision allows you to have instant access to your client demographics, sales history, and more. Keeping accurate records of your client information allows you to tailor your marketing messages to their needs. Record client formulas, artist notes, styling preferences, and pictures. Track lead sources and client type, created by you. Bring in repeat business and turn your clients into loyal fans with Envision's integrated Loyalty Point Program. Why would they go anywhere else when they get rewarded for shopping with you? Reward clients for purchases, referrals, and pre-booked appointments. You determine the value of points and redemption, so each plan is made to fit your business. Loyalty point balances displayed at the Point of Sale makes it easy for staff to see what the client has available. 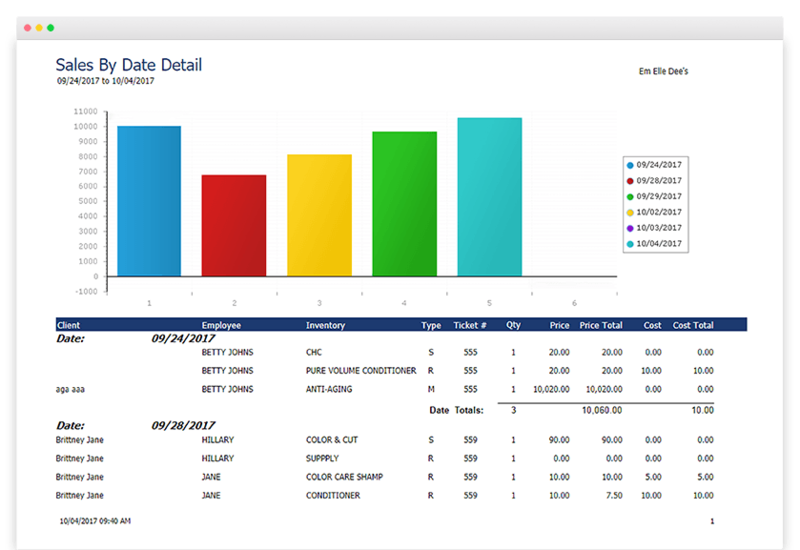 Everything is tracked Envision Salon Software so you, and your clients, don't have to worry about missing points. Do you dream about having consistent repeat business and a steady revenue flow? It's time to make your dreams a reality with Envision's Membership Program! Create multiple membership programs to fit any client's needs. Keep clients coming back with special offers and benefits exclusive to members. Automate recurring billing and get a daily report of your billing success so you never have to worry about missed payments. Envision keeps your employee information at your fingertips and gives your staff the power to take control of their success. 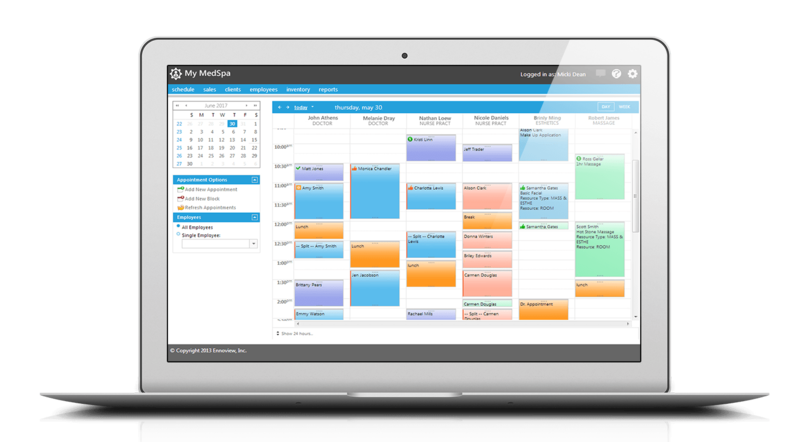 Envision calculates commissions and tracks hourly employees so you spend less time on payroll. Create qualified services to avoid booking mistakes and set level prices to avoid mistakes at check out. Limit or allow employee access to your important data with multiple security profiles. 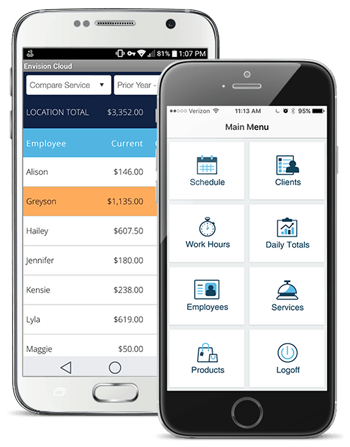 Staff can build their business at any time with the Envision Cloud App. Accurately calculate your business and employee goals with advanced reports. This is an essential tool for companies working with consultants and coaches! Set retail, service, and performance goals for your staff and your business. Improve employee coaching by always knowing exactly where your staff is succeeding and where they can improve. Stop running multiple reports and spreadsheets! Review your goals in one simple report. Get rid of Sticky Notes and Upgrade to Tasks! Forget about missed messages and remove those pesky sticky notes from your screen! Envision Tasks keeps your company's to-do list in a central location so you can stay on top of what needs to be done. Assign Tasks to a department or a specific employee. Categorize and prioritize Tasks so everyone knows where to start. Connect a Task to a client to keep record of staff interaction. Why wait until the end of the day, week, or month to see how your business is doing? One glance at your dashboard shows you important sales data, new clients, key performance indicators, staff schedules, and much more! Get a real-time snapshot of company performance. Forecast future sales and opportunities. Compare how you're doing today versus a previous day or date range. With just a few clicks, you can see your staff's – and your business’s – strengths and growing points. 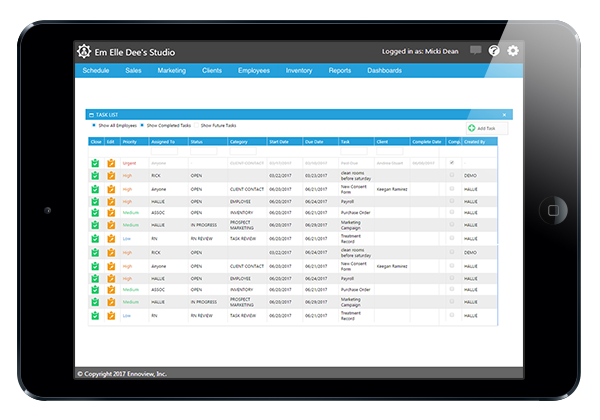 Envision makes it easy to review your most valuable data in single reports. Gather sales data, client retention, commission totals and much more! View comprehensive reports in detailed or summary views. Email the right reports to the right team members without leaving Envision. With a quick glance at your calendar, you can see the most important information about your arriving clients. Booking multiple services, even with different service providers has never been so easy. Never worry about overbooking your staff or resources. 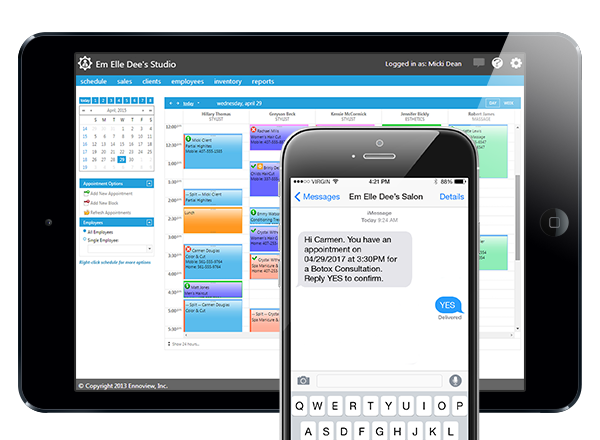 Stay in constant communication with your clients using Envision’s Smart Marketing.